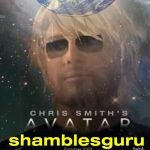 Shamblesguru Drat .... starting to reflect on the past ... anyone else remember Matthews Souther Comfort ... I wonder what happened to them? Shamblesguru Sitting with my brother.... and this is his recommendation ... health warning!